Botswana is a large landlocked country located in the centre of Southern Africa, a land of extreme contrasts and startling beauty. Botswana is unique. Not only is it home to some of the most extensive, unspoiled wilderness areas in Africa but it has been blessed with a remarkable normalcy. It has a proud history as a stable democracy and a peace- loving, progressive people with a deep sensitivity for their land and wilderness heritage. Tucked away in the remote Northwest corner of Botswana is the Okavango Delta, one of the most spectacular wetlands in the world. Formed by the waters of distant Angolan mountains, the Okavango River rushes to spill its precious liquid onto an ocean of burning sand, the Kalahari. 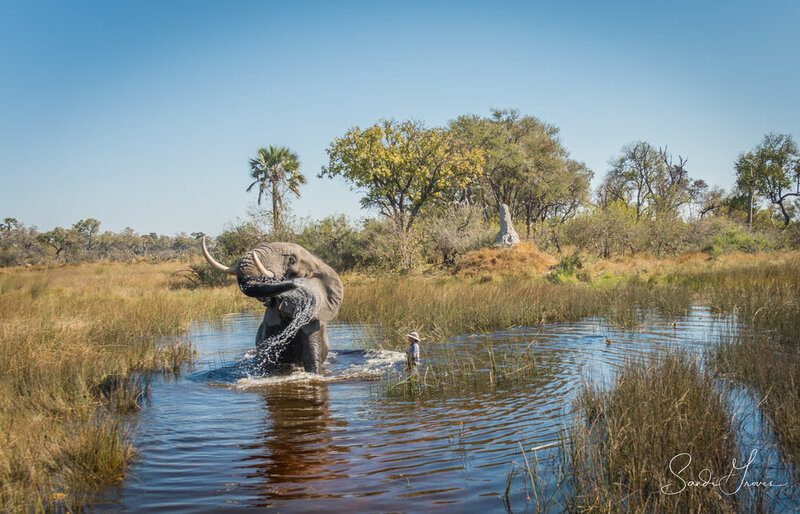 Like a hand spread across the Kalahari, the Okavango Delta forms a vast watery wonderland harbouring a myriad of sheltered waterways, channels, lakes, lagoons, flood plains and islands. In the heart of Botswana's Okavango Delta and at the southern tip of Moremi Wildlife Reserve, lies an enchanting place called Elephant Island. This island is home to two very special African Elephants - Jabu and Morula, and their adoptive parents Doug and Sandi Groves.